You will find a list of compatible solutions below, from GUI building tools, to development boards and compilers – the EVE Screen Designer from Bridgetech, or the Riverdi click from MikroElektronika, to name a few. 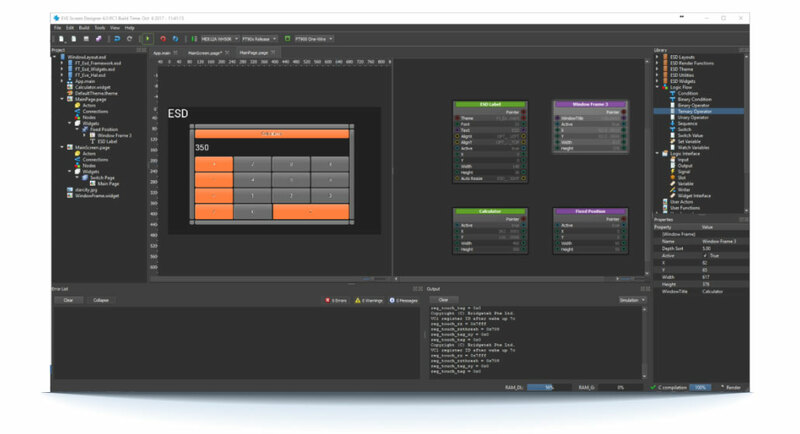 The EVE Screen Designer (ESD) 4.0 is the next generation of smart IDE for EVE, making EVE-based GUI development much easier to accomplish. This tool enables users to build a GUI application using a visual programming method without needing to know any EVE-specific display list commands. ESD 4.0 provides a WYSIWYG (“What You See Is What You Get”) environment for editing graphics, designing visual effects, and defining GUI application user logic, generating ANSI C code for the targeted hardware platform. Users can also choose to simulate the whole design to experience the UI before compiling and downloading the generated source code. Furthermore, ESD 4.0 has the capability to work seamlessly with Bridgetek’s FT9XX tool chain. Users can compile and link the generated source code with the FT9XX tool chain and upload it to the targeted platform without leaving ESD. Visual TFT is a standalone application used for rapid development of graphical user interfaces for TFT displays. The software generates code compatible with MikroElektronika compilers for all supported MCU architectures and implements a user-friendly environment. Drag-and-drop components provide a way to build your applications easily. Riverdi click is an adapter board that allows you to connect Riverdi TFT modules to the mikroBUS™ socket. 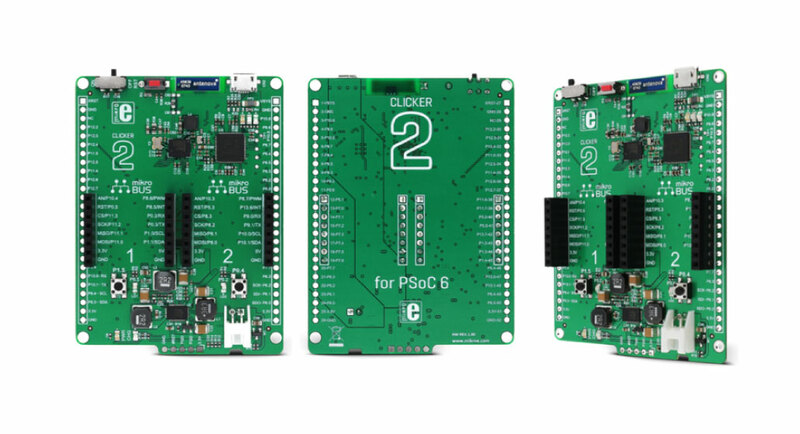 That means it is possible to use Riverdi click with MikroElektronika’s development boards – for example, the Clicker 2 range of boards, which have two mikroBUS™ sockets. The zif20 connector on the upper side of Riverdi click allows users to interface between the target MCU, and the FT8xx graphic controller on Riverdi displays. The Clicker 2 range of development boards from MikroElektronika offers you a variety of development tools that are compact and powerful. With two mikroBUS™ sockets, a Li-Po battery connector, integrated power management and battery charger IC, and a preprogrammed bootloader, you can make prototypes and standalone devices in no time. Add Riverdi click to any of Clicker 2 boards, and you can connect all the Riverdi displays to it. MikroElektronika offers 21 different compilers – 7 architectures (PIC, dsPIC, PIC32, ARM, AVR, FT90x, and 8051), each one on three languages (C, Basic, and Pascal). Each compiler comes with a intuitive and easy to use IDE, numerous hardware and software libraries, additional tools, and a comprehensive help file. The ready-to-use examples will help you start your project with ease. 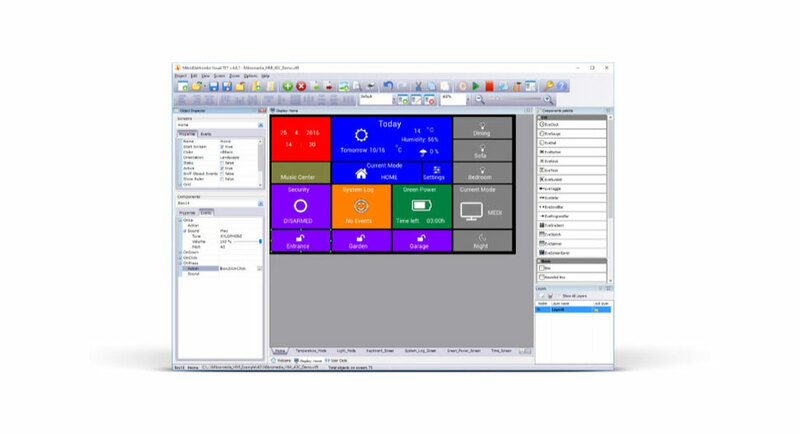 All MikroElektronika compilers have integrated Visual TFT software – a great solution for designing GUIs for your Riverdi TFT display.